Being in the remodeling industry, we have regretfully heard story after story from homeowners that have had terrible experiences with their previous contractors. It never ceases to amaze us how many people have been lied to, deceived, and taken advantage of by so-called “remodeling professionals.” As unfortunate as it is, it’s true that there are contractors out there that will do whatever it takes to get your money. Not only do they lack integrity in their word, but also in the quality of their work. It’s no wonder the term “contractor” tends to put a sour taste in homeowner’s mouths! For that reason, we always tell our clients to be weary of professionals that quote significantly cheaper prices than the industry average or make unrealistic promises. The harsh reality is that home remodeling is a complex ordeal –it is expensive, takes a significant amount of planning and time, and there are a number of hands involved: the draftsman, designers, the production manager, project managers, vendors and suppliers, city plans examiners, architects, and various subcontractors and tradesmen. From the outside looking in, a kitchen or bathroom remodel may seem pretty cut-and-dry, but the truth is that there are a ton of moving pieces and details that have to be managed from start to finish. It is critical for a contractor to have a specific process in place that each and every project abides by to ensure no single part or phase falls through the cracks. While poor project management is no excuse, it is understandable how some contractors can become overwhelmed (especially on larger projects) and drop the ball, resulting in some of those terrible home remodeling horror stories we mentioned. If there is no organized process, there will be chaos! This is why our tried and true process is so important; we want to make sure all of our clients fully understand our process before they commit to working with us. Having everyone on the same page and getting the project started on the right track is what sets the pace for the rest of the job and ultimately dictates the final outcome of the remodel. Designing your project is a major part of what we do (hints the name design-build!) Often times, clients come to us with the assumption that the design is optional. This is not the case whatsoever. In a recent blog, we explain why the design is necessary for every remodeling project, and that it is not limited to “the pretty stuff” like materials and finishes. The design portion is what allows us to lay out your entire project on paper, create a clear scope of work, and determine precisely what is required for completion. Our Interior Designer, Stephanie, specifies everything that needs to be addressed, selected, and ordered so that nothing gets overlooked. By drawing the floor plans and renderings, our team is able to see the structural and aesthetic modifications that will be made, which helps determine the professionals and tradesmen that will need to be involved. This information is essential in completion of the next step: estimating the project. Our knowledgeable estimators can typically give you a ballpark estimate during your initial in-home consultation, but in order to give you an exact cost for your specific project, the design process must be completed. Once the design specs are finalized and your products are selected, our estimators can go through the scope of work and determine the number of tradesmen required, how many hours of labor it will take them, and the total cost of the materials they will need. 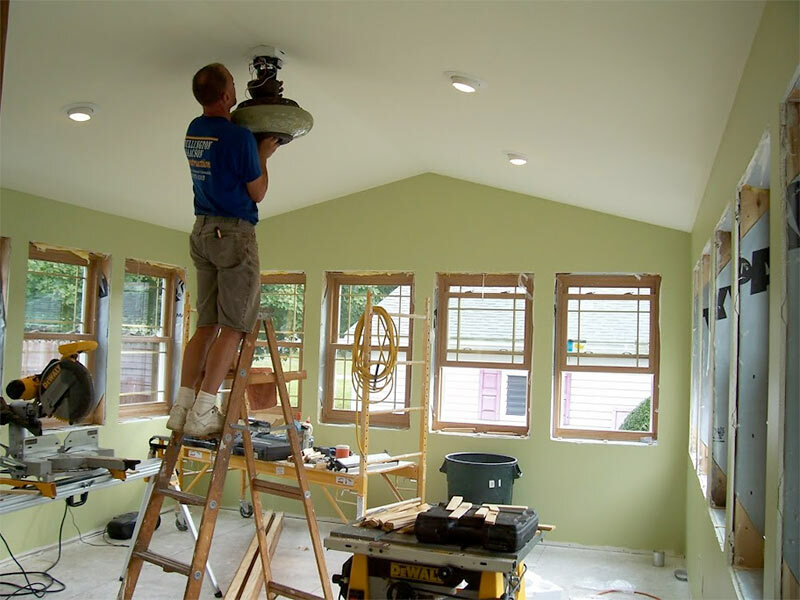 The estimating process is very involved and takes a good amount of time, especially on large or multi-room projects. Although it is tedious and time-consuming, estimating in this way allows us to be transparent and realistic about the actual cost of your project. 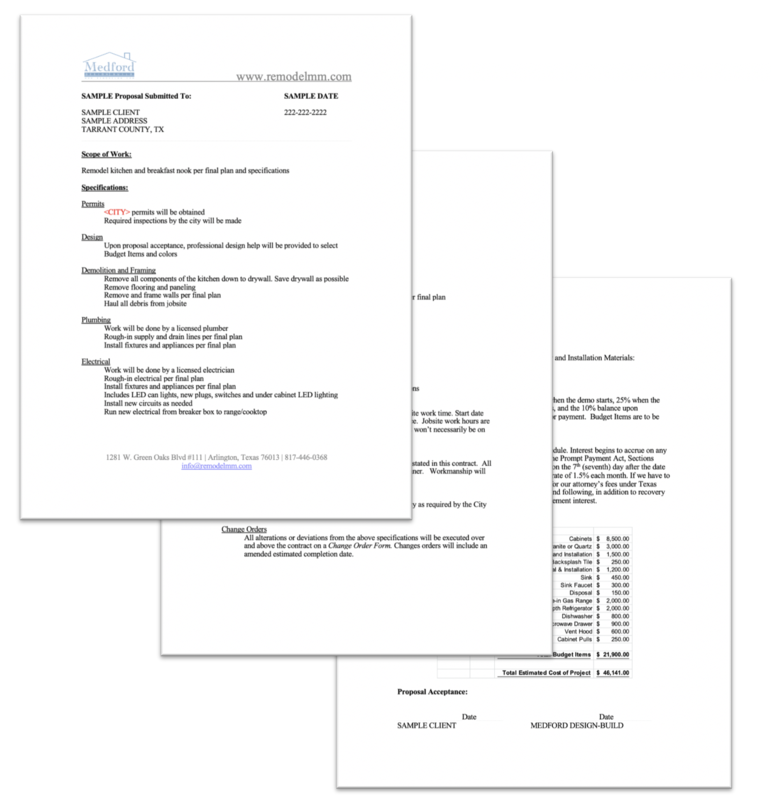 The finished document is not a “guesstimate,” but an actual calculation of the total cost of your project, including design hours, product selections, materials, and labor required for completion. If we were to try to estimate the project before the design phase is done, it would be full of errors and inaccurate information, and no one wants that when the subject of money is at hand! Again, staying within our process prevents unwanted surprises and unexpected financial burdens half-way through the project. Once the design has been finalized and the estimating has been completed, the contract is presented in a review meeting with you at our office. 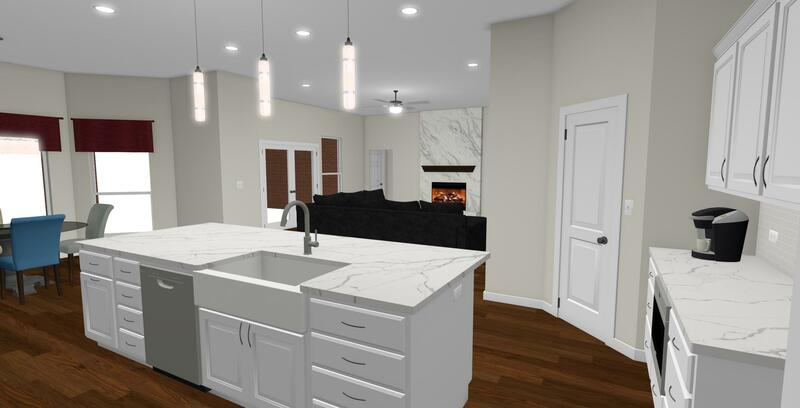 During this meeting, our designer and estimator will go over your floor plans, 3-D renderings, Scope of Work, and Budget Items Worksheet and provide you with our proposal to complete the construction specified in these documents. The in-depth meeting usually takes at least an hour. By the end of the meeting, you should have a clear understanding of exactly what will be done, how it will be done, and the total cost and timeline we are proposing. The purpose of the contract is always to protect the client, the contractor, the city, and the bank. It is expected that some revisions will be necessary after the review meeting. The changes may be in the design, the Scope of Work, or both. Our team will make notes of the revisions and typically have the updated designs and proposal ready within a day or two. After the final revisions are made, the contract is executed when both parties sign it, authorizing us to move forward with you as our client to complete your remodel as outlined in the contract. Should something need to be changed or added after the contract has been signed or after the project starts, a Change Order form must be submitted and also signed by both parties. The final step of our process is to complete the remodel. Construction will typically begin 4 weeks after the contract is executed (allowing us time to obtain necessary permits from the city and get all of your products ordered and delivered) and usually lasts 5-6 weeks depending on the size of the project. The remodel is complete when the client is completely satisfied, the contract has been fully executed, and the city has provided a final green tag. These 5 steps might seem like the common sense course of action, but you would be surprised at how many clients try to jump ahead of the process or micro-manage their project. Similarly, contractors that have no sense of process often lose control of the project and end up in a difficult situation – sometimes not even finishing the project at all. By presenting this process early on in our meeting with you and ensuring you understand the importance of it, we make the entire project an easier, more successful transaction. This makes for a better experience for you, for us, and for everyone else that is involved! If you are interested in learning more about our design and remodeling process, we’d be happy to chat! Contact us today for more information!